If you are new to the brand, Ceramiracle is an award-winning nutricosmetics brand based in the USA and specializes in anti-aging skincare solutions. Ceramiracle means the miracle of ceramides and this new nutricosmetic brand features a premium and advance anti-ageing formula featuring two patented ingredients backed by four clinical studies. It includes patented Phytofloral tomato extract, phytoceramides and a proprietary botanical complex. It contains no gluten, sugar and dairy. It made its debut in July 2015 with its bestseller First Light Ceramides Skin Supplement and Inv-Sun Skin Defense Supplement in March 2016. In 2017, Ceramiracle is proud to launch its latest product, True Bright Skin Brightening Supplement, a revolutionary one a day formula to nurture camera-ready radiant looking skin. Every capsule of True Bright Skin Brightening Supplement contains a proprietary botanical complex comprising sakura (cherry blossom) extract, colorless carotenoids from tomato, olive hydroxytyrosol and other synergistic ingredients to help your skin be at its photogenic best. With regular consumption, it will bring about skin benefits like cleaner & brighter skin, even skin tone, reduce pigmentation and camera ready radiant skin. True Bright Skin Brightening Supplement is a uniquely formulated one capsule a day oral skin brightening supplement containing naturally derived and nature-identical ingredients – Sakura (cherry blossom) extract, colorless carotenoids from tomato, olive hydroxytyrosol and other synergistic ingredients. These key ingredients that have been clinically researched for their respective efficacies. Sakura Flower Extract: clinically shown to lower AGEs (advanced glycation end-products), boost collagen levels and keep skin firm, soft and smooth. Olive leaf Extract: contains hydroxytyrosol – a powerful antioxidant known to reduce fine lines and wrinkles assists in skin lightening. Colorless Carotenoids: help to brighten and even skin tone by direct inhibition of melanin synthesis. L-cysteine and Vitamin C: clinically proven to enhance hydroxytyrosol’s inhibitory melanin production effect. It is recommended to take 1 capsule daily, preferably in the day after food with at least 8 glasses of water daily as adequate hydration can improve the efficacy of True Bright Skin Brightening Supplement. True Bright Skin Brightening Supplement is suitable for women and men over the age of 18 and it is a food supplement designed for long-term incorporation to your daily diet. True Bright Skin Brightening Supplement is 100% vegetarian and it contains no sweeteners, flavorings nor preservatives, gluten, dairy and sugar. To get rid of my post acne marks, i can rely on laser or brightening skincare products but sad to say that the above are not recommended for my sensitive skin. Hence, i can only turn to supplements to achieve the results that i want. True Bright Skin Brightening Supplement comes in capsule form which makes it easier to swallow and to consume. There’s no weird after-taste and for people with weak gastric, it is better to take it after meal. Two weeks since i have incorporated it as part of my supplement intake, i do observed that my skin is brighter and more even. Skin is also more firm and bouncy to the touch. I’m not sure if it is the change of skincare products or the incorporation of this supplements that attitudes to cleaner skin and lesser clogged pores. But i’m glad that the combination is working well hand in hand to give me healthier skin. As for post acne marks, i guess i must be more patient for it to fade totally. True Bright Skin Brightening Supplement is available on Ceramiracle.com, Watsons and Amazon and it retails at $109 per bottle (30 Capsules). “I’m very stressed” seems to be quite the common catchphrase amongst many these days as they try to cope and juggle between their many responsibilities and engagements. For Singapore, it was reported (in a survey by Health Promotion Board) that 24% of working Singaporeans experienced high level of stress in 2013, a 6% increase from a year ago. The increasing trend is a cause for concern as stress can lead to a plethora of health problems such as heart disease, sleep disorder, depression, bad skin conditions, and more. Amidst our fast-paced and stressful environment, how i wish that there’s 36 hours a day! After a long day at work, nothing beats unwinding on my couch with a cold refreshing drink and a nice warm shower! Recently, Spa Ceylon (my favorite natural and environmentally friendly products brand!) has launched the all new De-Stress range of health and wellness products which are designed to help ease stress and still the mind, thus promoting natural harmony and chakra balance. This new premier range of products are infused with precious Frankincense, soothing Sandalwood, refreshing Tangerine and Kaffir Lime to promote clarity, and fresh organic Aloe Vera to cool and soothe the body system. The range is also enriched with powerful Ayurveda herbs, and features the traditional Dashamula formula fortified with potent extracts of 10 medicinal goods. A little background introduction on Spa Ceylon – the world’s leading luxury Ayurveda brand with nearly 50 years of expertise in the field of natural health and beauty products. Spa Ceylon captures the romance of old Ceylon combined with ancient Ayurveda wisdom to create their range of majestic royal spa rituals & luxury product formulae designed to soothe, calm & relax the body, mind & soul. Today Spa Ceylon produces over 150 all-natural Ayurveda inspired personal care & wellness formulae, Their complete range comprises prestige skin, body, bath, scalp & hair care preparations, oils, balms & potions, home aroma blends, candles, diffusers, incense, herbal infusions & teas, handmade stoneware and spa accessories. All Spa Ceylon products are free of paraben, paraffin and alcohol. Its precise production and quality assurance procedures incorporate traditional herbal prescriptive with modern dermatological science, to protect and deliver the herbal benefits of the all-natural ingredients in their high-performance formula. Spa Ceylon promotes environmentally friendly products; they are not tested on animals, and are 100 percent vegetarian. The brand is also an advocate of sustainable harvesting and supports community fair trade. In view of the launch, Spa Ceylon has arranged for me to try out the De-Stress range of health and wellness products during a massage therapy session at Healing Touch Spa~ Healing Touch is Singapore’s best value, award-winning spa that provides “back to nature” wellness and beauty treatments through the healing power of plants with caring, therapeutic touch. Healing Touch Spa is Singapore’s most recommended spa on Facebook with 45,000+ likes and 2000+ reviews, one of the largest team of certified, skillful Therapists with many years of experience in 7 island-wide outlets. The Spa Ceylon De-Stress range is Spa Ceylon’s most premium among its brand offering so far. This high-performance range of powerful Ayurveda formula was a result of years of R&D to create the perfect mix of sensory and functional benefits to offer Spa Ceylon’s discerning customers the perfect de-stress solution. This premier range of products are infused with precious Frankincense, soothing Sandalwood, refreshing Tangerine and Kaffir Lime to promote clarity, and fresh organic Aloe Vera to cool and soothe the body system. The range is also enriched with powerful Ayurveda herbs, and features the traditional Dashamula formula fortified with potent extracts of 10 medicinal goods. The leading ingredient in the De-Stress range is Frankincense, which has been used over the centuries as a divine, purifying and deeply therapeutic natural essence. Frankincense is proven to be deeply calming, pacifying and revitalizing. It has been prescribed in Ayurveda for centuries as an anxiety calming tonic. “Spa Ceylon De-stress is designed as a total De-Stress solution, offering a perfect stress fix for today’s modern fast-paced lifestyles. When developing the products, we always consider how each product would fit into our consumers’ lifestyle(s). We have created a comprehensive range of products for the perfect stress fix everyday and everywhere.” said Shalin Balasuriya, Co- Creator and Director of Spa Ceylon. Like all Spa Ceylon ranges, all the products in the Spa Ceylon’s De-Stress range are free of silicones, paraben, paraffin and alcohol, and are suitable for all skin types. They are environmentally friendly, not tested on animals, and are 100 percent vegetarian. The De-Stress Relaxing Body Cleanser has a mild cleansing formula enriched with Aloe Vera & Virgin Coconut Oil. It is a perfect way to wash away the days stress, in the shower. This harmonizing & purifying cleanser is blended with powerful Ayurveda herbs & potent essential oils. It contains deeply calming frankincense that helps still the mind & ease stress. Uplifting Tangerine & Kaffir Lime promotes clarity & refresh the senses, while soothing Sandalwood helps harmonize & balance the chakras. Organic fresh Aloe Vera cools entire body system, while Virgin Coconut, Honey & Olive gently cleanse & nourish skin, improving overall health & wellbeing. For the perfect after work unwinding experience at home, the De-Stress Calming Body Elixir helps you and your loved ones to relax and sooth your body and mind. A harmonizing & hydrating elixir blended with powerful Ayurveda herbs & potent essential oils. Deeply calming Frankincense helps still the mind & ease stress. Uplifting Tangerine & Kaffir Lime promote clarity & refresh the senses, while soothing Sandalwood helps harmonize & balance the chakras. Virgin Coconut, Wheatgerm & Sweet Almond help nourish, hydrate & even out skin tone. Rice Bran, Soya, Olive & Honey soften& protect skin against dryness, improving visible youthfulness. The De-Stress Calming Body Massage Serum is a great “me-time” indulgence. It helps calm away stress & creates your very own calm cocoon. A harmonizing & soothing serum blended with powerful Ayurveda herbs & potent essential oils. Deeply calming Frankincense helps still the mind & ease stress. Uplifting Tangerine & Kaffir Lime promote clarity & refresh the senses, while soothing Sandalwood helps harmonize & balance the chakras. Naturally anti-oxidant Virgin Coconut, Soya & Aloe Vera help soften rough areas, while Sweet Almond & Rice Bran improve overall health & wellbeing. Wheatgerm & natural vitamins help nourish & even-out skin tone, improving visible youthfulness. The De-Stress Harmonizing Balm helps to clarify and refresh the senses, while Grapefruit & Bergamot help uplift & revive. A calming & relaxing natural balm with powerful Ayurveda herbs & potent essential oils. Deeply calming Frankincense helps still the mind & ease stress. Tangerine & Kaffir Lime promote clarity & refresh the senses, while Grapefruit & Bergamot help uplift & revive. Soothing Sandalwood helps harmonize & balance the chakras. The De-Stress Harmonizing Balm Roll-on helps to clarify and refresh the senses, while Grapefruit & Bergamot help uplift & revive. A calming & relaxing natural balm with powerful Ayurveda herbs & potent essential oils. Deeply calming Frankincense helps still the mind & ease stress. Tangerine & Kaffir Lime promote clarity &refresh the senses, while Grapefruit & Bergamot help uplift & revive. Soothing Sandalwood helps harmonize & balance the chakras. At the end of the massage, i brought home the De-Stress – Home Spa Set which makes a perfect caring gift for family, friends and your work colleagues. The set consists of Relaxing Body Cleanser (60ml), Calming Body Elixir (60ml), Calming Body Massage Serum (30ml), Dashamula Body Treatment Oil (60ml), Harmonizing Essence Mist (30ml) Harmonizing Balm (8g) and Cleansing Bar (35g). The therapist had use the Dashamula Body Treatment Oil on me during the deep tissue massage and i was surprised at its non-greasy formula. Normally i will avoid body massage that uses oil (unless there’s a shower facility in place). Not only that it smells heavenly, i told the therapist that i don’t find the need to shower after the massage ended. Wise choice as she said that it is best to leave the treatment oil for better results. * Disclaimer: Products Description and information and photos are extracted fromSpa Ceylon’s Presskit. In the midst of the busy-ness, i have allocated some pampering time for myself and off i went to Annabelle Skin. 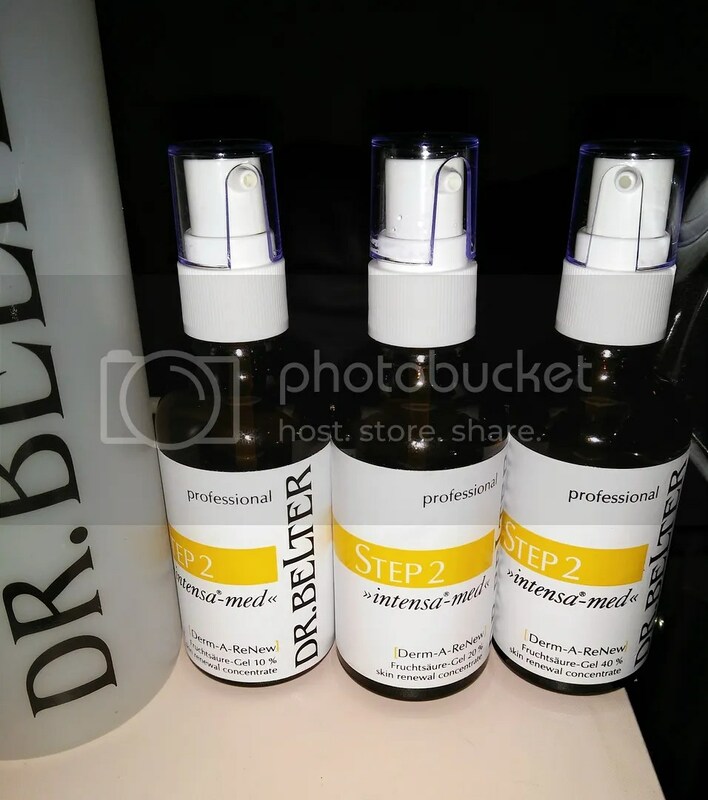 This time, i have tried one latest skin treatment by Dr Belter, an internationally acclaimed natural and organic skincare brand from the Europe. This award-winning German brand embraces a philosophy of using raw and natural ingredients combined with technology to formulate perfection for the skin. The new treatment is known as Derm-A Renew which is a Fruit acid treatment for skin in need of peeling and accelerated renewal. 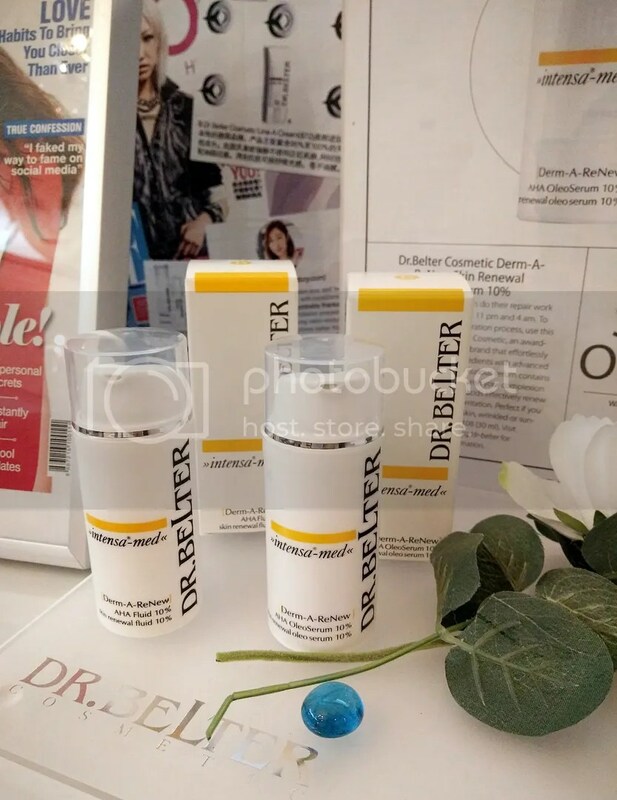 It is made possible by Dr. Belter Cosmetic’s new range of fruit acid products developed with its signature GreenTec concept to treat skin problems like acne, enlarged pores, uneven skin tone, fine lines, scarring and ageing due to sun exposure. 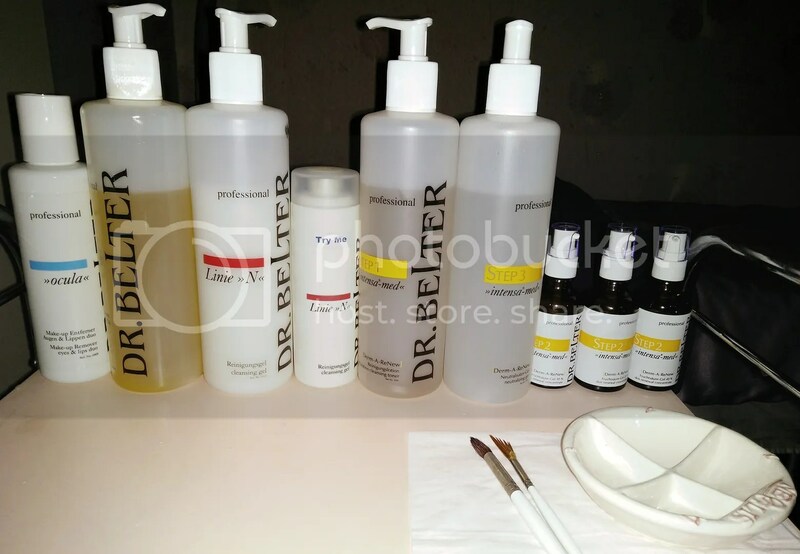 By leveraging on Dr.Belter Cosmetic’s signature GreenTec concept which combines natural and medicinal plants with high-tech pro-medical active ingredients, this unique facial treatment sets itself apart from others in the market with several notable features. While most peeling treatments in the market focus solely on peeling, the new Derm-A ReNew treatment is even more precise and targeted as it is developed with two key concepts – ‘Skin Renewal’ through the use of Dr.Belter Cosmetic’s newly developed fruit acid concentrates and ‘Skin Nourishment’ through use of the brand’s line of ampoules and facial masks tailored to the skin’s needs. Regular, systematic fruit acid treatment leads to an activation of cell division in the basal layer and consequently to an enhanced renewal of the skin layers. It also triggers an increase of fibroblasts and their connective tissue products, thus increasing the skin’s moisture and tone. One of the common problems of aged skin is the long regeneration cycle of approximately 40 days. Fruit acid treatment can stimulate the skin to accelerate its regeneration cycle to a pace of a typical young skin in approximately 28 days. Through an eight-session Derm-A ReNew treatment facial treatment, skin will be stimulated to experience the significant effects of a visibly refined skin profile. Before the Derm-A ReNew treatment, Mandy explained to me that the treatment will start cleansing, followed up by Derm-A-ReNew Preparation Cleansing Toner, a refreshing and anti-irritation liquid toner that works to ease and cool the skin before the course treatment with fruit acids. This is followed by the treatment use of Derm-A ReNew Skin Renewal Concentrates, a specific complex based on five standardised plant extracts, namely sugar cane (glycolic acid), blueberry (lactic acid), orange and lemon (citric acid) and sugar maple (malic and tartaric acid). The extracts within the concentrates work to breakdown the intracellular substances, and peel off dead cells, stimulating skin regeneration and increasing cell renewal rate to lead to an improved skin structure and complexion. The concentrates come in 10%, 20% and 40% fruit acids, and are used throughout the course of the eight-session treatments. The therapist will start from the lowest concentration of 10% for the first two sessions, and gradually increase the levels according to the skin condition as the treatment progresses every bi-weekly for an effective result. During each session, the concentrate will be administered step-by-step with a mask brush onto the face and neck and left on the skin for three – six minutes from the time of application. Took a quick picture before the Derm-A ReNew treatment commerce! As you can see, i have post acne brown marks which i wish to get rid of. My skin tone is also dull and lifeless. As my skin is on the sensitive side, Mandy will start off with the lowest concentration – 10%. I’m not new to chemical peel as i have done it twice but the downtime can be unpleasant. Will try to avoid doing it if possible.. Told Shirley from Annabelle Skin my concerns and she assured me that there will not be any downtime / discomfort. So rest assured that before the start of every treatment, the beautician will always check for any skin sensitivity or disorders. As i did not have any makeup on my face, Mandy used »Sensi-bel« Delicate Cleanser to cleanse my face thoroughly. After which, she applied the Derm-A-ReNew preparation cleansing toner. Before applying the Fruit Acid skin renewal concentrate, Mandy reminded me to keep my eyes shut. She applied the 10% skin renewal concentrate a with mask on face and neck. During the process, i felt mild stinging sensation on some areas of my face (Which is bearable and Mandy will reduce it by fanning the sensitive areas). The fruit acid was left on my skin for about 5 mins before it was cleansed off throughly. After drying my skin, Mandy applied the intensa-med Derm-A-ReNew neutralizing gel with mask-brush and remove again with compress. 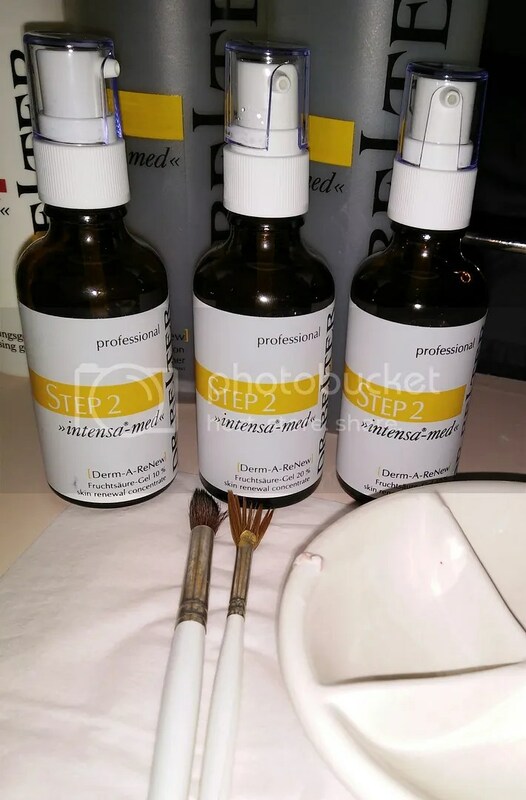 Once Skin Renewal is done, Skin Nourishment is carried out with the application of »intensa« ampoule and Mask. For my skin, Mandy has used the #04 Ampoule Sea Algae Extract which is known for healing, re-mineralising and firming properties. 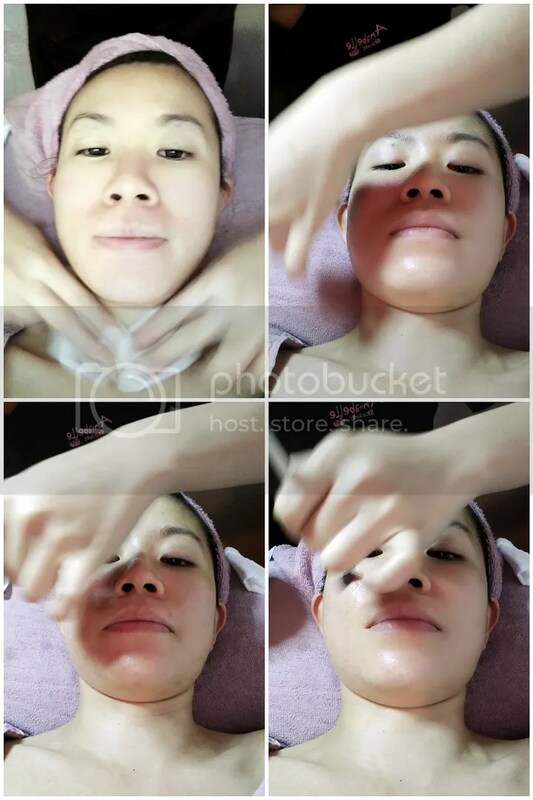 After applying the ampoule, Mandy applied a layer of the Ginkgo Biloba Solid-Bio-Matrix-Fleece Mask to soothe and restore my skin with frail capillaries. This mask also increase deep hydration and firmness with its pure, insoluble collagen fibres contained in the mask. Proper care of skin after Derm-A ReNew treatment is very important in order to achieve better results. To better take care of the new layer of skin, it is best to avoid excessive sun exposure. Sunblock is also important after the procedure as new skin is more susceptible to sun damage. I’m currently using Dr Belter Sun Protection (SPF 30) Face Elixir and i cannot stop raving about its texture. The sunblock has a fluid serum like texture and it feels so light on skin. It does not leave behind any stickiness, white cast and greasiness after applying. Moreover, it can be easily washed away with your regular cleanser (No need makeup remover) so i need not worry about it being too heavy and clogging my pores. The formula consists of protective concentrate for the face protects the sensitive skin from sunburn and other harmful effects of the sun. It uses biological cell protection complexes, such as Ectoin®, a special DNA shield from the plant cassia alata to prevent sun-induced skin aging and the formation of hyperpigmentation. 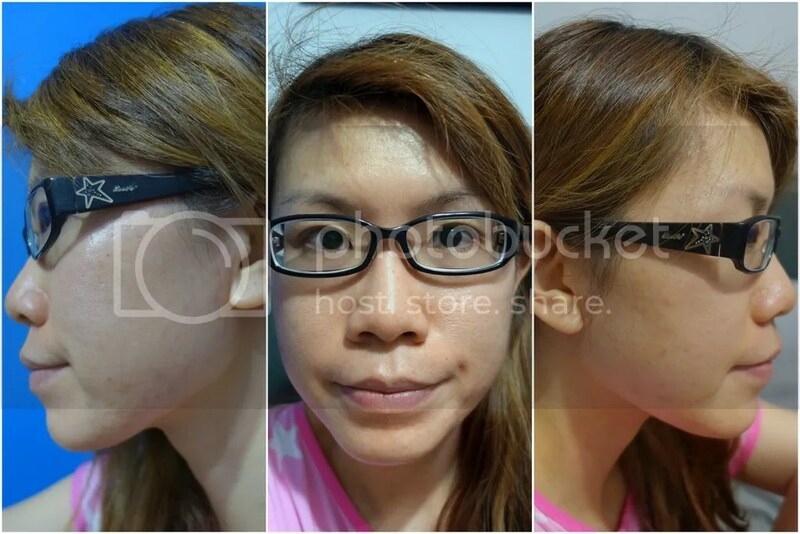 The picture is taken after Derm-A ReNew treatment and my skin turned so much smoother and brighter instantly! After treatment, you can also ‘maintain’ the results by making use of Derm-A ReNew homecare products. The following fruit acid products helps to skin consistently renewed skin even in between treatments. This light, night care emulsion that promotes dermal regeneration to maintain the refined pore profile and also helps to diminish the appearance of undesired pigmentation and wrinkles. It is available in fluid 10% (for acne and black-heads prone skin) and Oleo serum 10% (for more mature, dry and prematurely aged skin). Hours after Treatment – Skin felt clean and light! There’s no redness and no discomfort~ It is the direct opposite of what i experienced after normal chemical peel. The Next Morning After the Peel – My skin is so smooth and bright that it glows (i’m not kidding!!).. Definitely loving the softness and smoothness. There’s no peeling, no redness and no itchness. Hello everyone, i’m currently on vacation in the US and 10 days just zoomed past like that!! 😦 Will be heading back to Singapore in a few days time and i must say that i really miss the food back there. I have been consuming so much fried food, burgers, sandwiches and salad that i’m getting sick with it. Since i have some time to spare (my husband is off for his conference) so i will do a quick skin update. P.S: I hope i have some time to do a blog post on my US trip as this is our first self-drive trip and i’m so excited to share some must go / see places in Los Angeles, Las Vegas, Arizona and Orlando! Before the start of every session, Mandy will always access the current condition.As mentioned, Mandy will be focusing more on repairing and nourishment for my subsequent treatments. The facial treatment started off with cleansing. As i did not have any makeup on, Mandy went straight into normal skin cleansing with the use of Sensi-Bel Delicate Cleanser followed by Sensi-Bel Delicate Tonic to remove remaining residues. Next step is to exfoliate to get rid of impurities and dead skin cell before applying a thin layer of mask. After which, it was left under cold steam for 15 mins to calm and hydrate my skin further. After cleansing the mask off, it is time for extraction! Over at Annabelle Skin, they do not promote squeezing to decongest pores. Extraction is done using a special extraction tool from Switzerland together with special technique to remove blackheads & clogged sebum. As a result, it is not as painful and red as compared to conventional extraction. However, i felt that extraction seems more painful 1 week before or after my period so you can time your facial in accordance to your body’s reaction. After extraction, Mandy sterilized my skin with a high frequency machine to kill bacteria on the skin’s surface.. During the process, i experienced a mild ting-ing p sensation. After which, she applied Intensa Ampoules No.9 on my skin. This ampoule is good in treating and nourishing damaged capillaries and oily skin with large pores benefit plant tannin extract. At the last part of the treatment, Mandy applied a nourishment mask on my skin.. While the mask is left on my skin, Mandy used a handheld machine (with ‘heated’ setting) to ‘drive’ the nutrients for better penetration deep into my skin. After 10 mins, she changed to ‘Cold’ setting so as to seal the nutrients and close my pores so that my skin can reap full benefits from the ampoule and mask. After embarking on this facial journey at Annabelle Skin, i hardly get those big painful acne and i’m really thankful for such great skin improvements. If you are interested in trying out facials at Annabelle Skin, they are offering my readers 1st facial trial at 50% off, plus free skin analysis and tester set! Just have to quote my name ‘Jermaine Liang‘ when you are booking your appointment. Hello everyone, hope you had a great rest over the long weekend!! I had a great time during the Christmas period and now I’m back with another monthly update on my skin’s condition. As mentioned earlier, i have switched to facial at Annabelle Skinto care for my skin as i’m currently TTC-ing. Located in the heart of the city @ The Adelphi, Annabelle Skin (Founded in 1994) aims to serve as the trusted skin and body care companion to its clients as they go through different stages in life by providing quality treatments, effective results and personalized service. Annabelle Skin strongly believes that everyone’s skin condition is unique. Each skin and body treatment will be customized accordingly with the combination of skillful manual methods with advanced scientific beauty technology, using high quality products made with natural ingredients from Europe to produce the best and most effective results. Before the start of every session, Mandy (My Beautician) will always access the current condition. After few sessions of facial done, the condition of my skin has improved so much in terms of redness, hydration more controlled breakouts and better texture! Since my skin is more stable, she would be focusing more on repairing and nourishment for subsequent treatments. The facial treatment started off with cleansing. As i did not have any makeup on, Mandy went straight into normal skin cleansing with the use of Sensi-Bel Delicate Cleanser followed by Sensi-Bel Delicate Tonic to remove remaining residues. Next step is to exfoliate to get rid of impurities and dead skin cell before applying a thin layer of mask. After which, it was left under cold steam for 15 mins to calm and hydrate my skin further. After cleansing the mask off, it is time for extraction! Over at Annabelle Skin, they do not promote squeezing to decongest pores. Extraction is done using a special extraction tool from Switzerland together with special technique to remove blackheads & clogged sebum. As a result, it is not as painful and red as compared to conventional extraction. After extraction, Mandy sterilized my skin with a high frequency machine to kill bacteria on the skin’s surface.. During the process, i experienced a mild slight ting-ing sensation. After which, she applied Intensa Ampoules No.6 and repairig / nourishment mask on my skin.. While the mask is left on my skin, Mandy used a handheld machine (with ‘heated’ setting) to ‘drive’ the nutrients for better penetration deep into my skin. After 10 mins, she changed to ‘Cold’ setting so as to seal the nutrients and close my pores so that my skin can reap full benefits from the ampoule and mask. This picture was taken few hours later at my parents’ place after the facial and you can see how healthy, bright smooth and supple my skin was! There wasn’t much redness and skin blotchy-ness. As usual, there will be an after facial glow and skin felt so much ‘lighter’ and less tight. Like every facial, there will be mild purging (small pimples with pus) which is common as the facial will ‘push’ skin impurities embedded within pores to the surface. During these 2 days, i took extra care in applying pimple gel to dry it up. Despite the mild purging, skin still feels smooth to the touch and sensitivity has reduced. Skin tone has improved significantly in radiance / evenness and skin does not feel as oily. From 3rd day onwards, The breakouts from purging will start to heal and skin remains clear and bright. I always like it that oil secretion will reduce after facial so i just have to use more hydrating products to maintain it. Skin is also less bumpy, more radiant and healthy with reduced breakouts and clogged pores (due to the reduction in oil secretion).